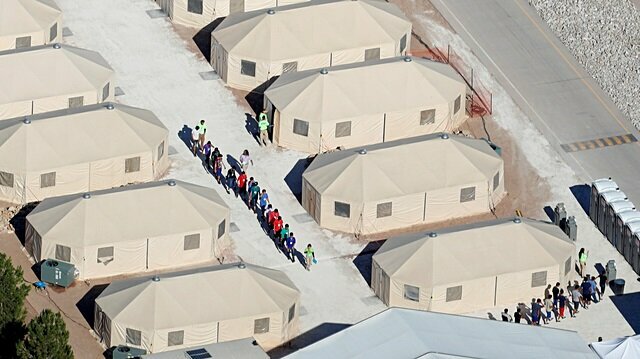 Immigrant children, many of whom have been separated from their parents under a new "zero tolerance" policy by the Trump administration, are being housed in tents next to the Mexican border in Tornillo, Texas, U.S., June 18, 2018. U.S. authorities have held some immigrant children who entered the country illegally and without a parent in a temporary "tent city" in Texas for months, violating a 20-year-old court order on how long minors can be detained, according to court filings by civil rights lawyers and immigration advocates. A U.S. withdrawal from a Cold War-era nuclear arms treaty with Russia could give the Pentagon new options to counter Chinese missile advances but experts warn the ensuing arms race could greatly escalate tensions in the Asia-Pacific.U.S. officials have been warning for years that the United States was being put at a disadvantage by China's development of increasingly sophisticated land-based missile forces, which the Pentagon could not match thanks to the U.S. treaty with Russia.President Donald Trump has signaled he may soon give the Pentagon a freer hand to confront those advances, if he makes good on threats to pull out of the Intermediate-Range Nuclear Forces Treaty, which required elimination of short- and intermediate-range nuclear and conventional missiles.Dan Blumenthal, a former Pentagon official now at the American Enterprise Institute, said a treaty pullout could pave the way for the United States to field easier-to-hide, road-mobile conventional missiles in places like Guam and Japan.Trump warns of nuke arsenal ramp-up after axing pactThat would make it harder for China to consider a conventional first strike against U.S. ships and bases in the region. It could also force Beijing into a costly arms race, forcing China to spend more on missile defenses. "It will change the picture fundamentally," Blumenthal said.Even as Trump has blamed Russian violations of the treaty for his decision, he has also pointed a finger at China. Beijing was not party to the INF treaty and has been fielding new and more deadly missile forces.These include China's DF-26 intermediate-range ballistic missile (IRBM), which has a maximum range of 4,000 km (2,500 miles) and which the Pentagon says can threaten U.S. land and sea-based forces as far away as the Pacific island of Guam. It was first fielded in 2016. "If Russia is doing it (developing these missiles) and China is doing it and we're adhering to the agreement, that's unacceptable," Trump said on Sunday.John Bolton, White House national security advisor, noted that recent Chinese statements suggest it wanted Washington to stay in the treaty. "And that's perfectly understandable. If I were Chinese, I would say the same thing," he told the Echo Moskvy radio station. "Why not have the Americans bound, and the Chinese not bound? "GROWING THREATU.S. officials have so far relied on other capabilities as a counter-balance to China, like missiles fired from U.S. ships or aircraft. But advocates for a U.S. land-based missile response say that is the best way to deter Chinese use of its muscular land-based missile forces.Kelly Magsamen, who helped craft the Pentagon's Asian policy under the Obama administration, said China's ability to work outside of the INF treaty had vexed policymakers in Washington, long before Trump came into office.But she cautioned that any new U.S. policy guiding missile deployments in Asia would need to be carefully coordinated with allies, something that does not appear to have happened yet.Mismanagement of expectations surrounding a U.S. treaty pullout could also unsettle security in the Asia-Pacific, she cautioned. "It's potentially destabilizing," she said.Experts warn that China would put pressure on countries in the region to refuse U.S. requests to position missiles there.Abraham Denmark, a former senior Pentagon official under Obama, said Guam, Japan and even Australia were possible locations for U.S. missile deployments. "But there are a lot of alliance questions that appear at first glance to be very tricky," he cautioned.Still, current and former U.S. officials say Washington is right to focus on China's missile threat. Harry Harris, who led U.S. military forces in the Pacific before becoming U.S. ambassador to Seoul, said earlier this year that the United States was at a disadvantage. "We have no ground-based (missile) capability that can threaten China because of, among other things, our rigid adherence ... to the treaty," Harris told a Senate hearing in March, without calling for the treaty to be scrapped.Asked about Trump's comments, China's foreign ministry said a unilateral U.S. withdrawal would have a negative impact and urged the United States to "think thrice before acting. ""Talking about China on the issue of unilaterally pulling out of the treaty is completely mistaken," spokeswoman Hua Chunying said. A Turkish police officer watched in tears a migrant child struggle for life after her boat capsized in the Aegean Sea off Turkey’s Mugla coast.At least two children died after a boat carrying 34 irregular migrants sank early Monday off Bodrum district, the Turkish Coast Guard said.Ela, carrying 34 irregular migrants, sank at 5:47 a.m. local time [0247GMT].Policeman Harun Kılıçoğlu arrived at the scene following a distress call and grasped the 7-year-old girl. He rushed to the ambulance parked 100 meters away.Video: Turkish cop cries for migrant child fighting for lifeParamedics gave her a cardiac massage as a visibly emotional Kilicoglu watched.She was pronounced dead at the hospital.Speaking to Anadolu Agency, the policeman said: "Hope filled my heart when the medics said the child could be saved. I was very happy when I heard that. I wish she had lived. I wish I could hold her hand tomorrow.“I felt the same way a father would feel when he carries a child. I have two children myself. First, I thought about my own children. Then I thought about the children around me. I only thought about saving her life, I didn’t think of anything else. "His wife and colleague Gonul Kilicoglu said: “I'm proud of my husband...We all have children. No matter what their religion, language and race is, it is our duty to help them when needed.”Turkey has been the main route for irregular migrants trying to cross into Europe, especially since 2011 when the Syrian civil war began. Australian opposition lawmakers have offered a deal to resettle 150 refugees from a Pacific detention camp, which if accepted by embattled Prime Minister Scott Morrison could strengthen his tenuous grip on power.Morrison's government is on the verge of losing its majority, after a devastating by-election on Saturday, and key independents have warned their support hinges on him freeing children from the Australian-run detention camp on Nauru island.The Australian government has steadfastly refused to allow any refugees arriving by boat to enter the country, instead detaining them in remote Pacific detention centres.Nearly 1,300 asylum seekers have been detained in Papua New Guinea and Nauru for more than five years after being intercepted while trying to travel to Australia by boat.Australia stares at hung parliament as by-election count goes to the wireNew Zealand has offered to resettle 150 refugees, a proposal Canberra has previously said it would only accept if opposition lawmakers agreed to change the law to prevent any refugee from ever travelling to Australia in future.Amid warnings by aid agencies of a health crisis on Nauru, the opposition Australian Labor Party said it would agree to a compromise amendment which would only ban refugees sent to New Zealand. "Labor is prepared to compromise with the government," deputy Labor leader Tanya Plibersek told reporters in Canberra. "We understand that it is beyond time that these people who have been reported by their doctors and other support workers to be in the most desperate circumstances, find a new home. "Australians protest PM's remarks on embassy relocationMorrison said he would consider the compromise.Eleven child migrants were transferred from Nauru to Australia for medical treatment on Monday, only hours after two independents said they would only support the government if it stopped detaining children.Morrison is poised to lose his one-seat parliamentary majority after voters, angry about the party's ousting of former prime minister Malcolm Turnbull, deserted the ruling Liberal Party in a Sydney by-election.Turnbull was the sitting member for the Sydney seat and quit politics after being dumped.Although counting continues, Morrison is likely to have to rely on the support of five independents to prevent a no confidence motion that could trigger an election. The next general election is due by May 2019.Two independents have said their support is conditional on the immediate resettlement of 52 children detained on Nauru.Human rights groups warn all refugees on PNG and Nauru are in need of resettlement as a controversial resettlement deal with the United States stalls.In 2016 Australia and the United States agreed to a refugee swap which would see Australia take people from Latin America and in return the United States would take up to 1,250 refugees held in the Australian camps. Two years on, only 422 refugees have been given U.S. resettlement. "Lives are at risk," said Catherine Stubberfield, a spokeswoman for the U.N. refugee agency, UNHCR. "They need to step in now and make sure that further harm and even deaths are not occurring." The court filings also show the percentage of children at Tornillo who were released to sponsors "dropped significantly" in August from June, according to the court filings.